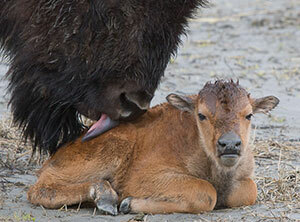 Increase the number of wood bison in the wild and help ensure their long-term survival. Wood bison populations in Alaska and Canada were almost gone by the early 1900s, as were plains bison further south. Conservation efforts in Canada since 1957 allowed wood bison to increase from a few hundred to more than 5,000 bison in healthy, free-ranging herds. Reestablishing wood bison in Alaska would be a major step forward for international conservation efforts. Enhance Alaska's wildlife resources by restoring a key grazing animal to northern ecosystems. Increase habitat and species diversity in some areas. Benefit Alaska's people and economy. Wood bison could provide a number of socio-economic benefits, supporting viewing, photography, and tourism. Wood bison will also provide an additional source of food. Communities in northern Canada benefit from wood bison herds by harvesting bison for food, developing local guiding businesses for hunters and tourists, and being involved in managing bison and their habitat. Similar benefits could apply in Alaska. Alaska contains vast areas of excellent wood bison habitat. A number of meadow habitats in Interior and Southcentral Alaska support the same grasses and sedges that are favored by wood bison in Canada. The lower Innoko/Yukon rivers area includes thousands of acres of habitat available for bison, which could support thousands of animals. Enough bison habitat exists in Alaska to support as many as or more wood bison than Canada currently holds. 100 years ago, moose did not exist in western Alaska. Today they are a significant part of the diet and culture of Alaska residents there. Wood bison will soon enrich the diet and culture of people in western Alaska. One hundred years from now, wood bison may be a significant part of the diet and culture of Alaska residents.